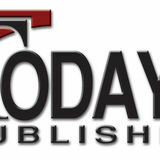 ...to our 50th Annual Sale... Our family continues to operate M.C. Quantock Livestock as a family ranch. We have worked darn hard to earn the trust, confidence, loyalty and respect of the people we deal with... today 73% of our bulls sell to repeat customers many of them, second generation. Our bull program sets the standard for the industry and while imitation is the greatest form of flattery, remember, we are the originators. We stand behind every bull we sell. We give you the service you deserve and we appreciate your business. We’ve built a good big cowherd over time producing bulls strictly for commercial cowmen. Unlike a lot of bull producers, we’ve paid for our ranch and cows with our cows. Traditional purebred guys sell dreams... we sell reality. In 25 years our cowherd has produced in excess of 25 million dollars worth of bulls... no “smoke and mirrors”, no “trendy numbers”, no unproven sires, just the real deal. We produce durable, high quality bulls that sire those “fancy” high quality calves the order buyers love, and we produce lots of them, but best of all, they are affordable. We’ve sold nearly 12,000 bulls, staged 49 bull sales and our family has been in the bull business for over 100 years. Buying the right bulls is an important part of your success. Our sale is an experience. A bull sells every 50 seconds for nearly 6 hours... hundreds of good, solid uniform bulls in 8 bull lines, quality bulls at everyday prices. 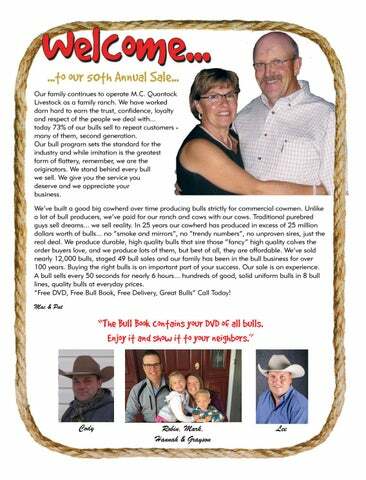 “Free DVD, Free Bull Book, Free Delivery, Great Bulls” Call Today!